‘Tis the Season to See Puppets! 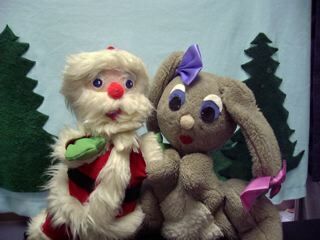 Santa loves Belinda Bunny’s Carrot Pies! Piccadilly Puppets is once again pleased to perform ‘Twas the Night Before Christmas at the Aurora Theatre in Lawrenceville! The Aurora Children’s Playhouse is a wonderful place to take your kids for live performances! They present plays, puppets, music, magic – the best children’s entertainers in Atlanta and beyond on Saturday mornings, at least once a month. The performances are affordable, too; tickets are only $7, or you can buy a punch card for 10 admissions good for any show for only $50. What a great Christmas gift for a family!